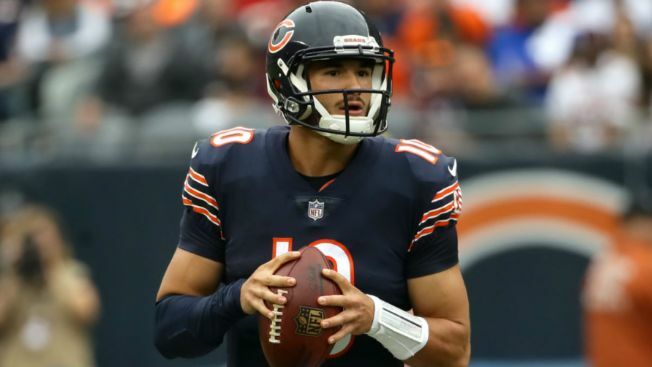 The Chicago Bears will likely be without their starting quarterback for a second straight week, as Mitchell Trubisky has been listed as doubtful for the team’s game against the New York Giants. Trubisky, who also missed last week’s game against the Detroit Lions, has been limited in practice all week, and has yet to be cleared to throw by the team’s training staff. Barring a last-second change, Chase Daniel will get his second straight start for the Bears when they battle the Giants at MetLife Stadium. Special teams stand-outs Benny Cunningham and Sherrick McManis, who have been out of practice this week, were both listed as doubtful for the game as well. Defensive tackle Akiem Hicks, who missed all three practices this week for the Bears with an Achilles issue, has officially been listed as questionable by the Bears, as was defensive end Bilal Nichols, who is battling through a knee issue. Tight end Adam Shaheen and linebacker Aaron Lynch, both of whom missed last week’s game with concussions, were full participants for a third straight day and are expected to play in New York on Sunday. Kick-off is scheduled for noon.